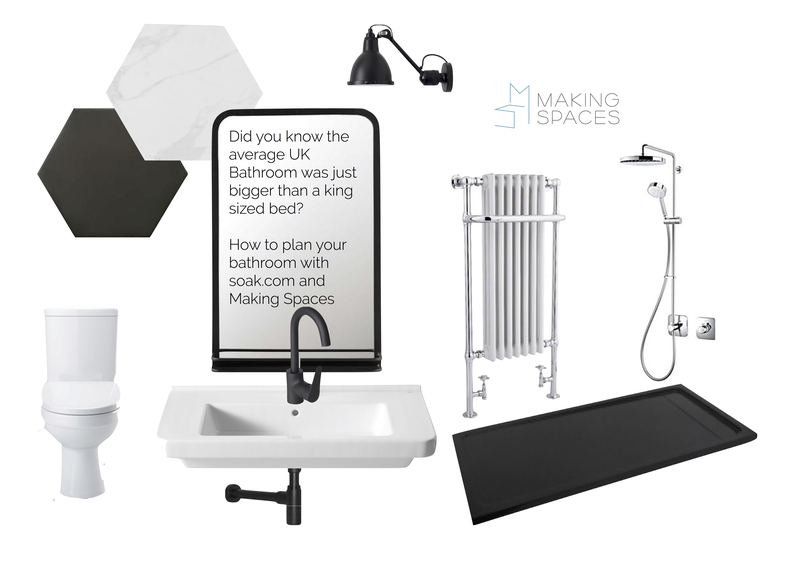 Did you know, the average size of a bathroom in the UK is around 2.4m x 1.8, or 4.4m2. How mad is that? Not much bigger than a king sized bed. Now, consider the average bath size is 1.7m x 700mm it is clear why space can be tight. And clear why they’re a bugger to plan for. The bathroom layout (small room top right of the floor plan) has been tweaked and fiddled with several times over the past 4/5 weeks. It’s mental how much difference 5cm can make. Which is why i’ve rinsed the internet for pieces perfect for our UK average sized space. Here it is (will be) with our newly fitted aluminium windows. At approximately 1.9m x 2.1m, every cm counts and i’ve found some key pieces for bijou spaces at soak.com. Let me show you what’s arrived this morning, bright and early at 8am. The first item being a small footprint loo. Ideally, I would have liked a hidden cistern, but that meant boxing in, and boxing in meant lost floor space. And a loo is a loo. It’s not something i’m going to spend that much time eyeing up design wise. The Sabrosa is neat, clean, simple and comes with a soft close seat. Job done. The radiator however, was something that definitely needed to look good as well as do the job. With the bathroom having two walls of timber construction exposed to the elements, this small space needed a high BTU output for its size. I wanted to be able to hang a towel on it, so a super tall one was out of the question and a horizontal one would have taken up too much floor space. The traditional tall three column towel radiator ticked all of the boxes. Kicking out just over 3000 BTU without taking up too much space, it’s going to keep our bathroom from feeling cold and damp, giving us lovely dry, warm towels on tap. It will also tie in nicely with the rest of the column radiators in the house. We had to make the biggest compromise on the shower. Did you hear that darling husband? I compromised. Take note. Initially, i’d got my eye on a walk in shower and on paper it kind of fitted. But the reality was, a person sitting on the loo was going to have a foot in the shower tray and probably a wet foot at that. So I finally got over myself, and selected the most minimal enclosure I could find (and afford). It’s hard not to get big plans when you’re designing a space that doesn’t exist yet. You tend to imagine them twice the size they actually are. I blame websites showing bathrooms as big as your entire first floor. If you’ve got that kind of space. Brilliant. Pop that roll top in the middle of the room with a rainfall shower over the top with your bathrobe strewn over your antique chaise longue. Looks great in a photo, but who the hell has a bathroom that big? Soak’s great range of radiators meant I bagged one for our loft bedroom too. We’ve not actually got a lot of wall in that room, what with the full run of windows on one side, sliding doors on another, exposed brick behind the bed…. ….leaving us just one wall to place a radiator and I wanted to leave that as clear as possible. A super slim vertical column was perfect, and the gorgeous matte anthracite finish will look great with our new aluminium windows (EEEEE!). They’ve still got their protective film on here so you can’t see the frame that well. More on the windows in due course. If you’re looking to redesign a bathroom, shower-room or need some new rads, take a look at soak.com. They really do have some great items for spaces large and small. I can’t wait to get their delivery up there. Kind of need a staircase fitting first though. Written in collaboration with soak.com. All opinions are my own. Always. I only ever work with brands I love and think you guys will love too. Thanks Meera. Can you actually imagine a bathroom you could spend time walking around in? It would be a real treat to have. Gone and changed the layout one final time now since this post. I think i’ve finally solved it. Phew! Omg the sound of all that black matte is heavenly! I cannot wait for this reveal Karen! And you’re so right about the size of bathrooms. When we were doing ours, I just found myself getting really downbeat from shopping because all the showrooms were bigger than one floor of our house. Madness! Ikea probably have the best showrooms for bathrooms of a realistic size, but I looked at some of their sinks yesterday and they ALL come with cabinets. So not that flexible if you’re looking for something wall hung really. I can’t wait to get on with it now. Mainly so I can move all this stuff out of our hallway!! Oooh, exciting! I actually think it’s more sensible having a non-boxed in loo – it’s so much easier to get to the cistern if there’s a plumbing issue.